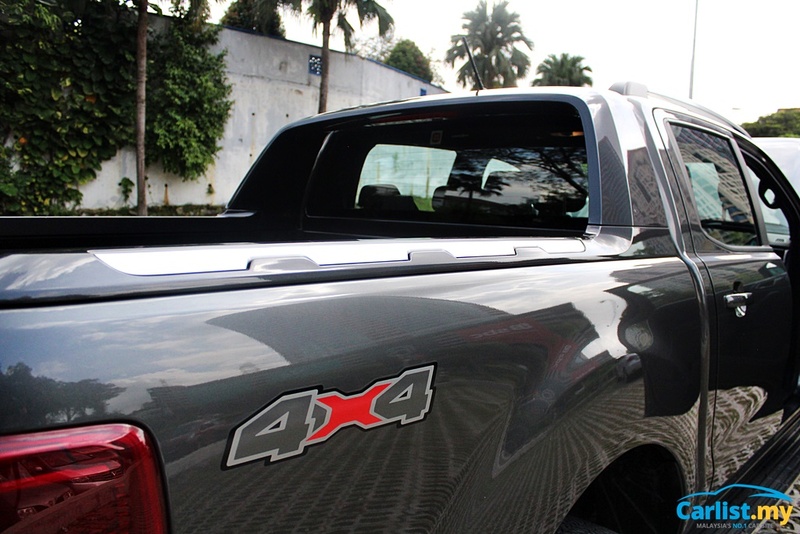 For some, the decision to buy a pickup truck is made easy if their work or leisure activities require the additional cargo carrying capacity, offroad traction, and the ability to carry five occupants in relative comfort.  But for a growing population of owners, a truck is simply a lifestyle statement, with its commanding size, macho styling, and day-to-day usability. Dollar-for-dollar, not much comes close when one needs to assert dominance on the roads. It's for this reason, pickup manufacturers make no bones about telling customers that a truck will literally change their lifestyle and the way they work, live, and play... as if to awaken an inner Indiana Jones in all of us. Notwithstanding the fact that many won't even see a splatter of mud on their wheel arches, trucks themselves have also assimilated to become very much like SUVs: the perennial lifestyle statement of the 21st century. Trucks are now safer, pack loads of equipment, are extremely fuel efficient, and most importantly more spacious and comfortable on the inside. The Ford Ranger, in addition to its longstanding heritage of performance and durability, has always straddled a good balance between form and function very well. While Toyota and Isuzu primarily boast about their product's rock-solid engineering and fuel economy, Ford flaunts styling, unique colour options, bold bodykits, and stylish interiors – none more so than the Wildtrak variant. But for the first time, the Wildtrak isn't the top of the range, that glory, along with most of the hype surrounding the launch of new Ranger, belongs to the full-blown, dune-bashing Ranger Raptor model. But whilst almost everyone can't seem to get around its rather stratospheric RM200k price tag, it pays to know what the Raptor stands for: it is first and foremost, a halo-model. The Raptor is meant to widen the boundaries of what is possible within the segment, its a statement of the company's engineering capability, and is meant to stir the soul of any proper petrolhead worth his/her salt. The Raptor is meant to amaze just based on its breadth of capability and sheer presence. So, saying that it costs RM200k but isn't fitted with all the equipment the cheaper variants offer is like asking why a Honda Civic Type R doesn't come with nine cupholders (like the Jazz), or why a Porsche 911 GT3 RS is not equipped with surround view cameras. 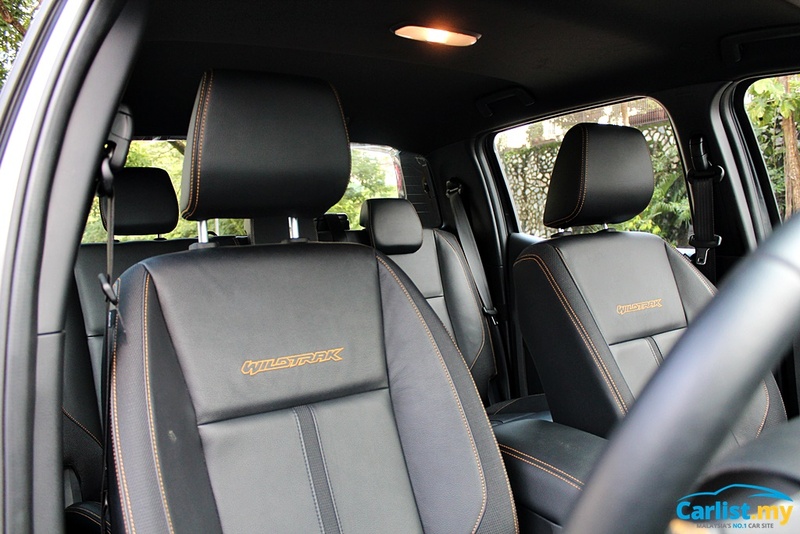 The Raptor is the perfect synthesis of a leather interior and the capability of withstanding Operation Desert Storm, so above all, it's an emotive purchase. But, by throwing in everything-but-the-kitchen-sink worth of options and equipment, Ford may have just created the best Wildtrak there has ever been. It offers distinct styling, the full suite of safety technologies (that no other variant offers) and for nearly RM50k less, it’s the only other variant that offers the same 2.0-litre bi-turbo engine and 10-speed automatic powertrain found on the Raptor model. So by all accounts, it remains the most sensible and calculated option for the average “gaya hidup” type of buyer. 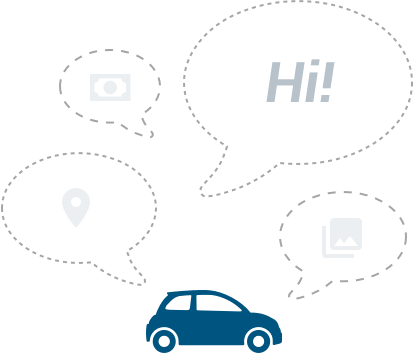 Safety: Six-airbags, ABS with EBD, Brake Assist, ESC, Traction Control, Hill Descent Control, Forward Collision Warning (FCW), Adaptive Cruise Control, Lane Departure Warning and Assist, Autonomous Emergency Braking (AEB) with Pedestrian Detection.  Ask any girl, of any age, and I can almost assure you that there are three cars that they love, or at the very least, think are extremely cool – the MINI Cooper, the Range Rover Evoque, and finally the Ford Ranger. The first two, given their high-street presence and iconic style, and the Ranger for its macho looks and commanding stance. If, you don’t believe me, ask around. 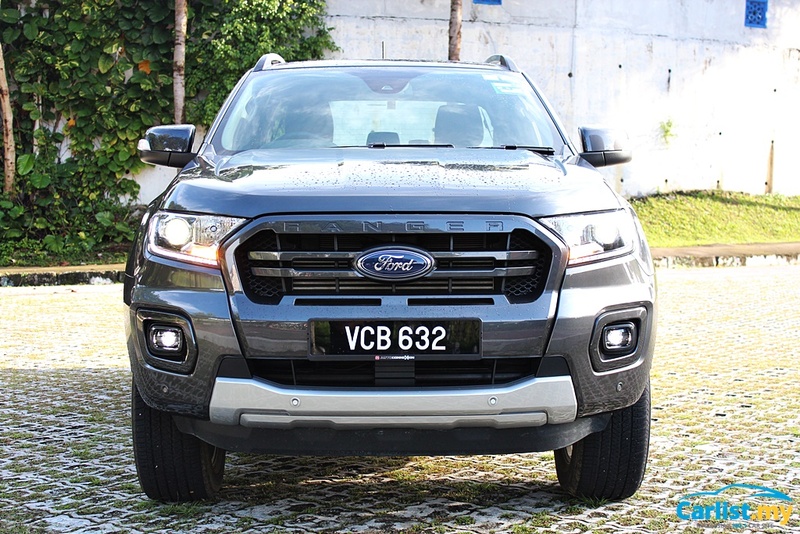 The Wildtrak, like its forebears, is spiffed up with a suite of cosmetic add-ons such as the Wildtrak radiator grille at the front, shiny sidesteps, and roof rails around the flanks, and the sport bar atop the truck bed at the rear. A Cargo LED light integrated on the sport bar offers decent illumination of the truck bed at night, which is more helpful than you might think. Also, note that the Wildtrak adds auto wipers and wing mirrors with integrated puddle lamps and turn signals. Finished in its Magnetic Grey paintwork and shiny 18-inch wheels, the Wildtrak has not lost any of its brute appeal, whilst still managing to look slightly more premium than most of its competitors. Perhaps it’s a case of familiarity but for some reason, I prefer the dashboard layout of the Toyota Hilux – much of it has to do with curvaceous contours and curves, which is much more modern SUV than pickup truck. 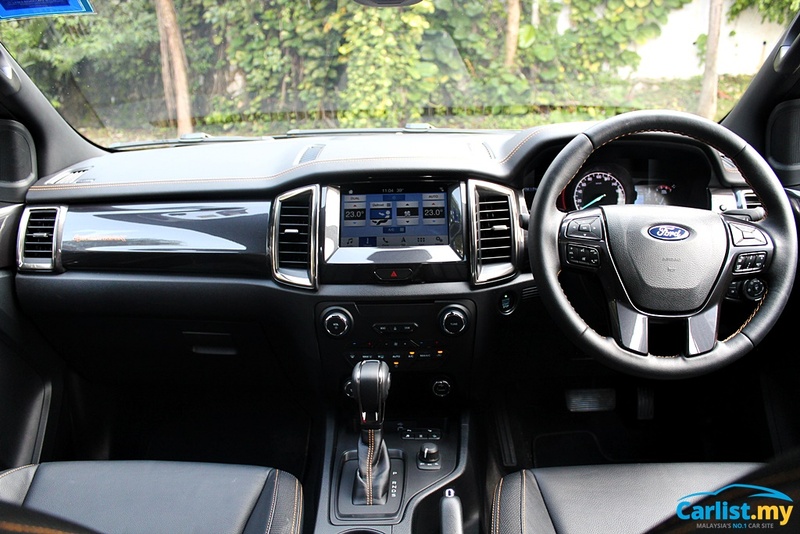 However, I can still appreciate the Ranger's interior finish and spot-on ergonomics – buttons and dials are right where you need them to be, and the 8-inch Sync 3 infotainment system, in terms of functionality, ease of use, and screen resolution, is miles ahead of what other competitors are offering. The sequential gear selector, positioned on the gearknob has always been a bit of an enigma for me – now I suppose made even more futile when you take into account there are ten gear ratios to cycle through, so for the most part, it’ll probably never be used. Touchpoints such as the steering wheel, armrest, gearknob, door panel, and the soft-touch trim atop the dashboard make the interior a really nice place to be in. 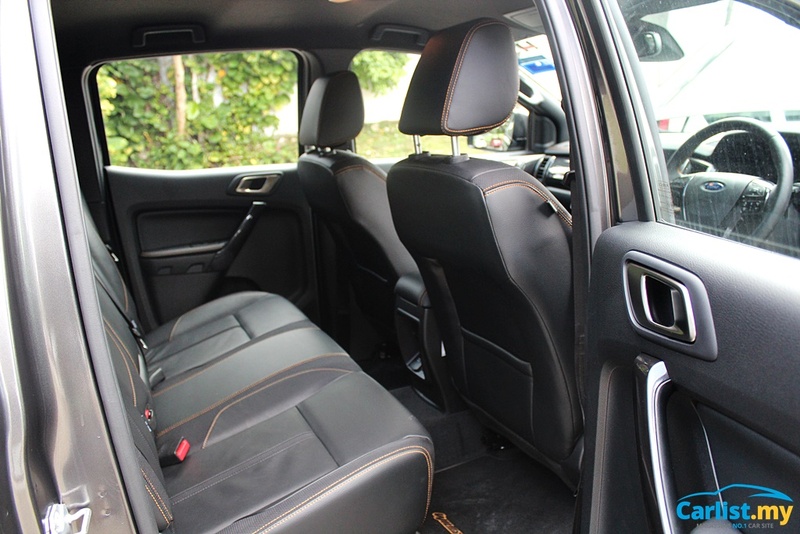 At the front, while the front seats are well padded and supportive, the rear seatbacks could be a tad softer in my opinion, which would make long distance drives far more enjoyable for all passengers. Entry and egress at both the front and back, given the large door apertures are very good, and also make the Ranger very practical on a daily basis. 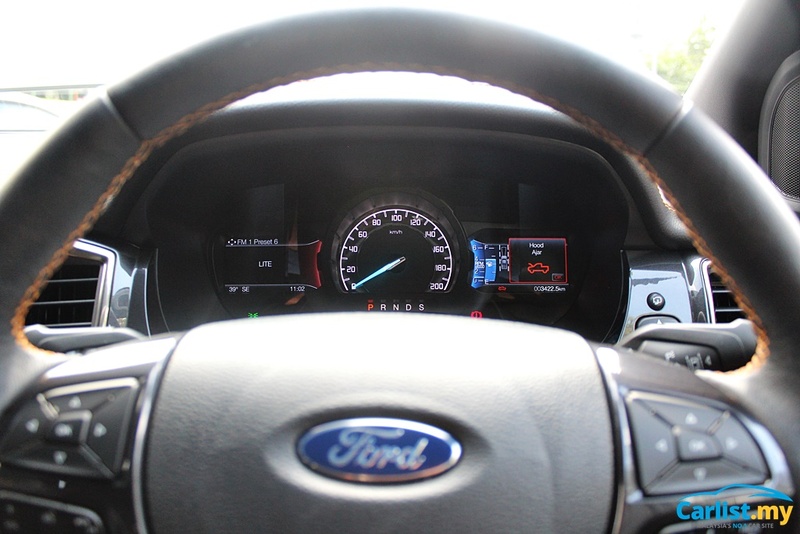 Another notable mention is the twin 4-inch TFT colour displays on the instrument cluster, which are easily configurable to feature a variety of data sets just using the controls on the steering wheel. 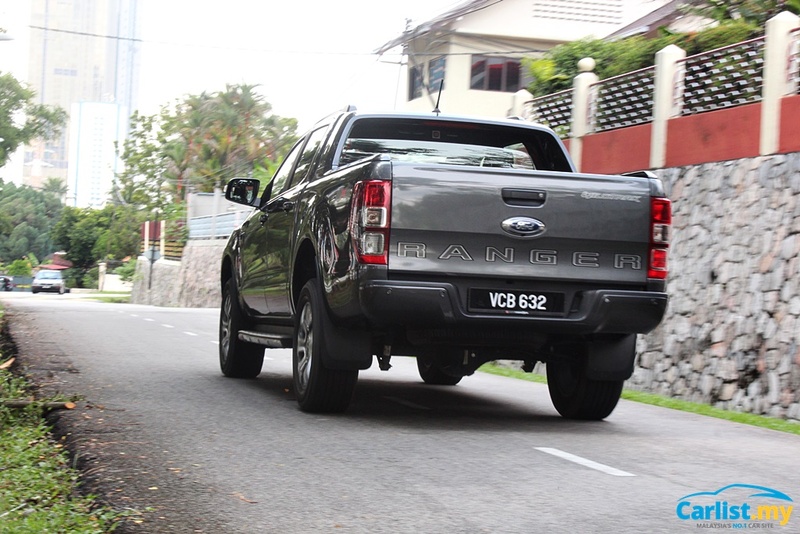 The most instantly appreciable aspect of driving the Ford Ranger is its driving position. Despite it being a high-riding pickup, there’s ample adjustability granted by the 8-way powered driver’s seat; so one can seat low enough to feel integrated with the car. And I have no shortage of praise for the new electric power steering (EPS) system: the linear steering effort is as light as a Perodua Myvi, for lack of a better comparison. It makes U-turns in this two-tonne colossus astoundingly easy; even after driving the car in the city for nearly three hours straight, my arms never felt tired. No doubt, the EPS system has foregone some steering feedback and clarity the older system had, which came in handy when going off-road because one needs to know what the front tyres are doing, but for the most part, on normal roads, it’s simply superb. The powertrain is no less cutting-edge, with a first-in-class 10-speed automatic transmission and a 2.0-litre bi-turbo engine that punches out 213 PS and 500 Nm. Between the quick spooling turbos and a gearbox that can drop up to three gears the moment you put your foot down, there’s no shortage of performance when you need it. 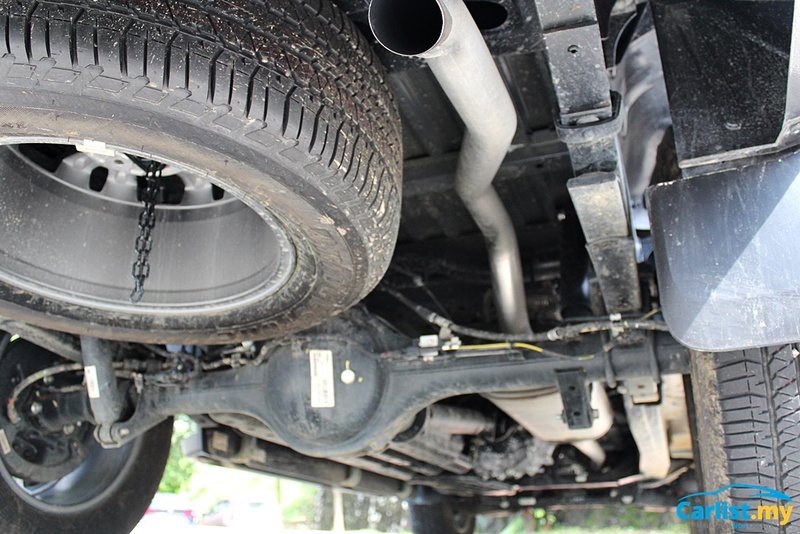 At right about 1,500 rpm the torque is delivered swiftly and strongly. There onwards it revs freely up to around 3,500 rpm. The torque delivery, for the most part, is linear and very predictable, so you always know the amount of go you’re going to get, proportional to the throttle application. The usable and accessible powerband pays even greater dividends when going off-road. But for the most part, despite the eager revving nature of the bi-turbo four-pot, revs rarely rise above the 2,000 rpm mark. 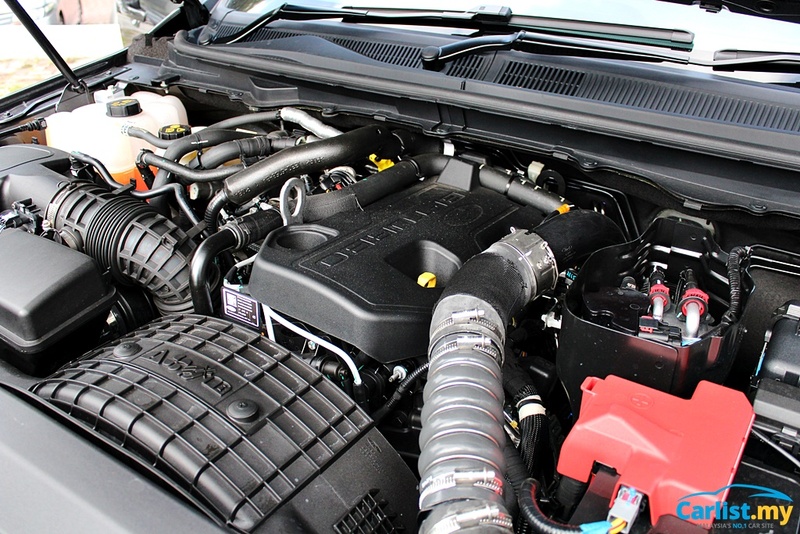 Given the ten closely stacked ratios, the Ranger Wildtrak almost always remains in the engine’s natural powerband. For instance, even at 60 km/h, the gearbox is already in 7th gear, maintaining revs at roughly a tick over 1,300 rpm. This makes even more sense when cruising on the highway: the gearbox slots into its 10th gear as you approach 95 km/h, which in turn delivers superb highway cruising ability and impressive economy figures – as low as 6.4 litres/ 100 km on the highway, climbing up to 10.2 litres/100 km whilst crawling about in city traffic. The numbers make up a substantial improvement over its predecessor, and if memory serves me right, are almost as frugal as Isuzu’s D-Max, which has for years been lauded as the most fuel-efficient pick-up truck in the market (albeit with less power than the Ranger). The handling, a hallmark of any Ford, be it car or truck, is firmly in place. The Ranger Wildtrak’s stiff ladder-frame underpinnings and bodyshell operate very cohesively, which in turn endows the Ranger with superb on-road dynamics and cruising ability. I wouldn’t recommend blasting down the highway at 180km/h, but it does manage speeds of 140 km/h with sure-footed ease. 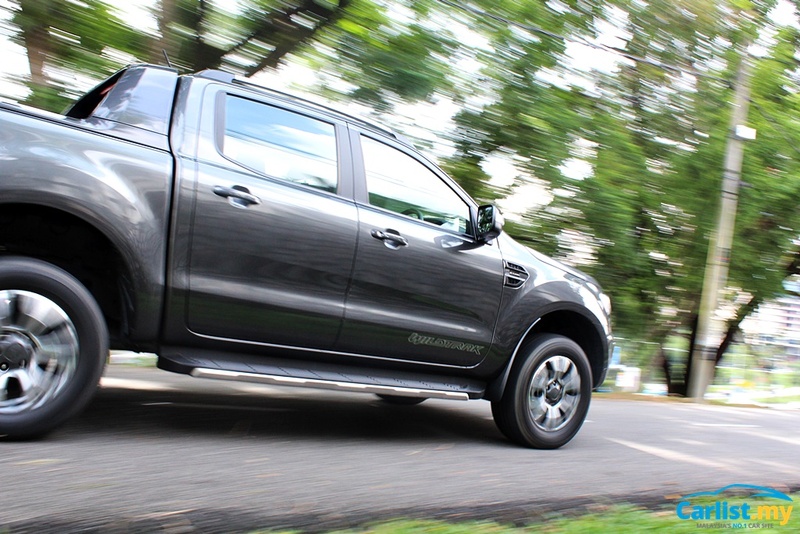 Another feature that comes in handy while on the highway is the Wildtrak's first-in-segment Adaptive Cruise Control; which works very smoothly, in terms of maintaining the desired speed, but also slows down rather instinctively when the car ahead slows down. It’s not too bad in the corners too: mechanical grip is impressive, to say the least, and there’s a real sense that Ford has nicely applied their learnings from the Everest SUV onto the Ranger. Yes, there’s still a bit of scuttle shake at the rear when unladen and going over bumpy roads, but for the most part, you wouldn't call the ride quality uncomfortable. Add to that NVH levels that are impressive even for a car, let alone a pickup truck. If anything, a slight downside of the driving experience is that the brakes tend to feel a bit spongy compared to what I’ve experienced in the Toyota Hilux and Mitsubishi Triton. It takes a while to compensate for the lack of brake response; this will be a point of learning for most owners I suspect. All-in-all, you’d be pretty hard-pressed to find a pick-up truck that offers as much day-to-day usability and practicality. It looks good, drives and steers even better, and its safety features are unmatched within the segment. 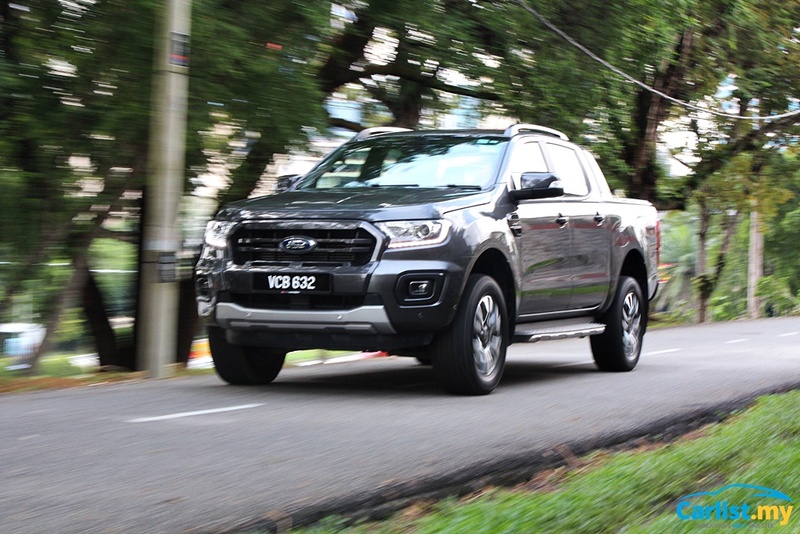 It’s doesn’t come cheap though – pushing RM145k, some RM13k more than its predecessor – the Ranger Wildtrak is as expensive as SUVs such as the Mazda CX-5. If you don’t need the cargo capacity (and let’s face it, if you simply needed to carry stuff, there are cheaper variants), the Wildtrak becomes a slightly more challenging point to justify, even when taking into account its lifestyle orientated overtones. But it must be said that not many vehicles offer a full suite of active safety systems at the Ranger's price, and with a growing number of buyers who are willing to pay a premium for added safety systems, I'd wager it's a bit of a bargain. 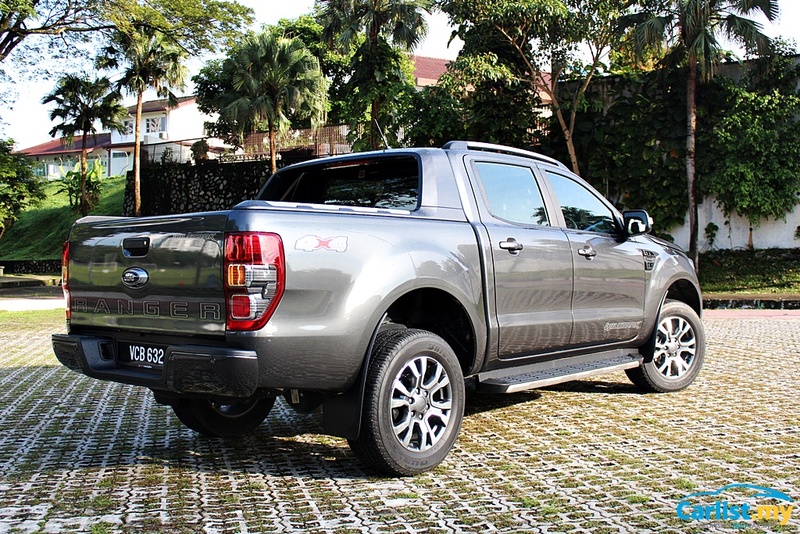 Also note the Ford Ranger XLT+, which is priced at RM124,888 is more competitively priced and specified to go up against the likes of the top spec Hilux 2.8 (AT) L-Edition (at RM 138,000) and matches it closely in terms of performance and equipment. Not forgetting, the upcoming Mitsubishi Triton (prices have yet to be announced), which also boasts bold new styling and advanced driver assistance features. However, if I were to encapsulate the best aspect of the new Ranger Wildtrak, it is that it’s no longer a spiffed-up version of another Ranger model, now standing as a unique offering within the larger lineup. While the Raptor might have stolen the initial hype, the Wildtrak remains the sweet spot between having all the form and functionality of a modern pickup truck.